Jill Eisenberg is our Resident Literacy Expert. Jill began her career teaching English as a Foreign Language to second through sixth graders in Taiwan as a Fulbright Fellow. She went on to become a literacy teacher for third grade in San Jose, CA as a Teach for America corps member. She is certified in Project Glad instruction to promote English language acquisition and academic achievement. In her column she offers teaching and literacy tips for educators. Last week, I spoke about my experience teaching in a school where nearly 85% of my students were English Language Learners and English was not the primary language spoken at home. Using a bilingual book with a Spanish-speaking parent in the classroom is a strategy I learned teaching in San Jose, CA as a part of a parent engagement program called “Los Dichos de la Casa” by Silicon Valley YMCA. Whether your classroom has only a few English Language Learners (ELLs) or a majority, bilingual and dual language books can encourage close reading of a text and increase accessibility of the text to ELLs. 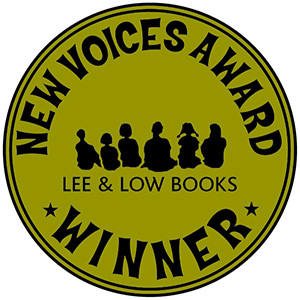 Over the next few posts, we will model how bilingual and dual language books are being used in classrooms to foster deep, critical thinking and a love of reading. Scary New Releases: KILLER OF ENEMIES and THE MONSTER IN THE MUDBALL! Just in time for Halloween, we’re excited to announce the release of two new novels from our science fiction and fantasy imprint, Tu Books: Killer of Enemies, a post-apocalyptic retelling of an Apache monster slayer legend by award-winning Native American author Joseph Bruchac, and The Monster in the Mudball, a hilarious supernatural mystery set in England. In Killer of Enemies, seventeen-year-old Apache hunter Lozen hunts monsters to ensure the protection of her family from the Ones, maniacal warlords who rule in a post-apocalyptic Southwest. Fate has given Lozen a unique set of survival skills and magical abilities. Soon she realizes that with every monster she takes down, Lozen’s powers grow, and she connects those powers to an ancient legend of her people. It soon becomes clear to Lozen that she is not just a hired gun. As the legendary Killer of Enemies was in the ancient days of the Apache people, Lozen is meant to be a more than a hunter. Lozen is meant to be a hero. I had two Korean roommates in college. Ever since then, I’ve said, “Someday I will learn Korean and visit Hyun Mi in Korea.” Last year, when I made new Korean friends here in New York City, I decided that “someday” needed to finally be today. I started to learn Korean from a book and a podcast, got addicted to Korean dramas, and this May, finally made that trip to Korea I’ve been meaning to make for over a decade. On my way to Korea, I had a 7-hour layover in London, another place I’ve never seen in person before. 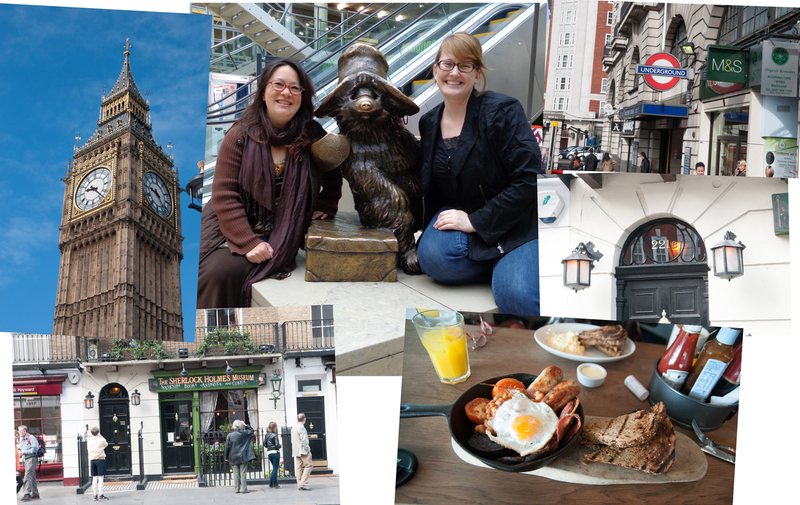 I got to meet Cat Girl’s Day Off author Kimberly Pauley, who showed me 221B Baker St. and the whole area around Parliament—Big Ben, the London Eye, and Westminster Cathedral, for example (the outside—no time for the inside), and then we finished off our whirlwind tour with a full English breakfast. I didn’t get to visit my old roommate, but I did visit my new friend from New York, who had moved back to Seoul. 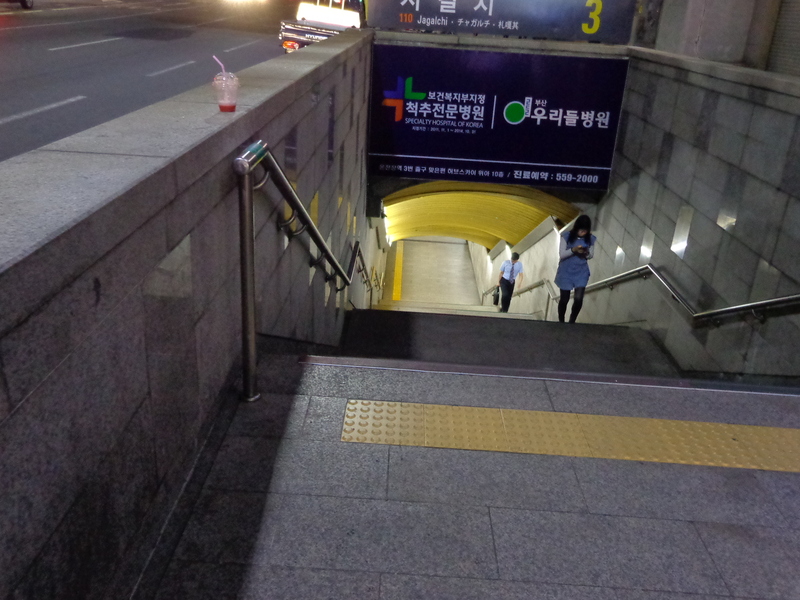 I stayed with her and her family in Mokdong, a suburb of Seoul, which I loved not only because I was visiting my friend, but also because I got to experience Korean culture from a closer point of view, not as a tourist in a hotel but as a guest. I got to do normal everyday things with my friend, like going to the grocery store and post office, to the bookstore and to the repair booth on the corner run by the ajussi who might know how to fix my purse (sadly, he didn’t have a good solution). I was greatly impressed with the public transportation system, which got me everywhere I needed to be, and often had malls in the stations! I also met up with the Talk to Me in Korean crew (from whom I’m learning Korean), who happened to have a meetup when I was in Korea. Here I am with Hyunwoo Sun, the founder of Talk to Me in Korean, and his wife, Mi Kyung. 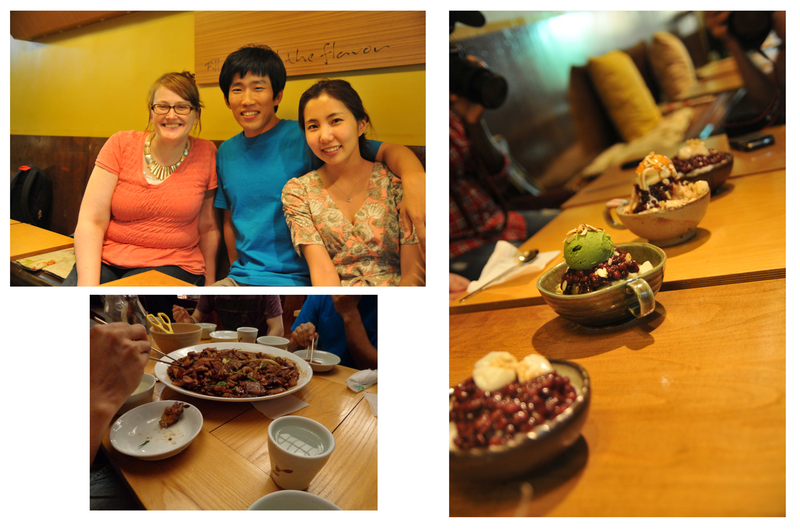 A few of us went out for a kind of fusion chicken, the name of which I’ve forgotten, and then patbingsoo—sweet red beans over shaved ice—after the meetup of over a hundred TTMIK listeners. I love Korean dramas, which are often historical, so of course I wanted to see places like National Treasure #1, the Namdaemung Gate (officially known as Sungnyemun), which burned down in 2008 and was just recently restored and reopened, and Gyeongbokgung Palace in the heart of Seoul. The folk museum was fascinating, letting me see Korean history in person—for example, they had a living replica of a Korean street that brought you forward in time from the Joseon era to the 1990s. Today is Women’s Equality Day and we’d like to thank the women of the past, present, and future for their contributions to women’s rights and gender equality. Women’s Equality Day was created to commemorate the the 1920 passage of the 19th Amendment to the Constitution, granting women the right to vote, but it also highlights women’s continued efforts toward full equality in America. After students have begun reading and writing, speaking and listening still have an integral place in the classroom – so much that the CCSS set specific standards for speaking and listening to promote a balanced approach to literacy: “The speaking and listening standards require students to develop a range of broadly useful oral communication and interpersonal skills…students must learn to work together, express and listen carefully to ideas, and integrate information.” The speaking and listening standards expect students to participate in “rich, structured conversations” in which they are building on the ideas of others and speaking in complete sentences. Teachers need to create models and routines for deliberate and intentional dialogue that builds bridges to the students’ reading and writing. In that way, students have the opportunity to also recognize the organic intertwining of these modes of receptive and expressive language. Look! Up in the sky! It’s a Puerto Rican parrot! 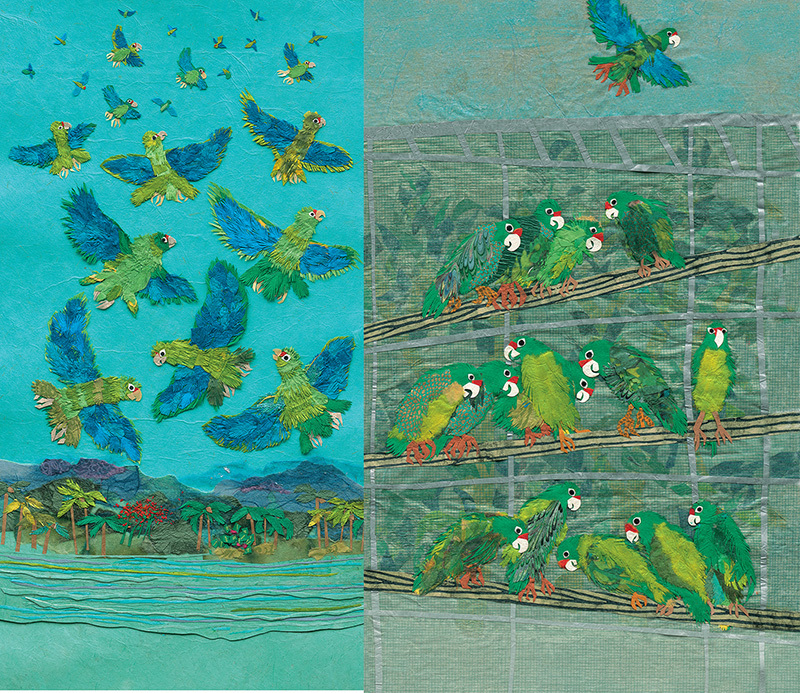 Out in October, we’re excited to give you a sneak peek at Parrots Over Puerto Rico!